Google Analytics is probably the most popular and widspread web analytics tool on the market. One of its core features is giving clear and detailed insights about where your visitors are coming from. This is done in the “Acquisition” panel, and it represents one of the most important dashboard for any web marketer. Basically, here you can discover how many of your visitors came to your website directly typing your URL in their browser or clicking on a bookmark (this is called “direct” traffic), how many found your pages through a search query on Google (the “organic” traffic), how many are coming from links posted on social networks, etc. So, Google Analytics has to manage a lot of possible traffic sources. The following flow chart, taken from its official documentation, explains how it does the source recognition and which is the priority. Lots of articles and books have been written on how to increase a website’s visibility on Google, but you won’t find so many resources talking about the opposite task: how to delete your website from any search result page. 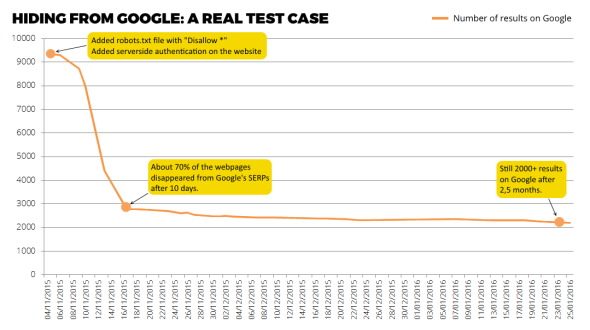 I recently had to do this job for a non-critical asset and I had fun in monitoring how much time is required for a website with about 10K indexed pages to be completely forgotten by the most popular search engine. a server-side authentication has been added to the website’s root folder, just to be sure that Google won’t be able to access those URLs anymore. Then I just sat down and watched my website slowly disappearing from Google’s SERPs. I am surpised about the results: after 10 days, about 70% of the original 10K pages were cleaned, but the rest is taking a lot more. Now, after 2 months and half from the beginning, I still have more than 2K indexed pages. Note that you can speed up the process with further actions, in particular resubmitting a cleaned XML sitemap or even manually blocking URLs through Google Webmaster Tools. Anyway, it’s very interesting to see how Google handles this kind of situation.